Dark warm brown shirt with long sleeves and a close-fitting, tall, pleated collar. Floor-length cross placket coat of a vertically ribbed dark warm brown fabric with long tailored sleeves ending below the wrist. Wide pleated obi of a teal blue velvet. 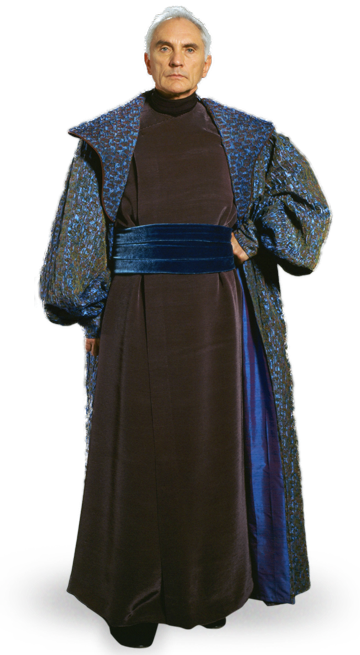 Floor-length draping robe of a teal blue/rust shot textured velvet or velvet-like fabric with large bell sleeves that are gathered to cuffs at the wrists. It also has very large, wide-shouldered scalloped lapels trimmed in dark red taffeta or taffeta-like cord. 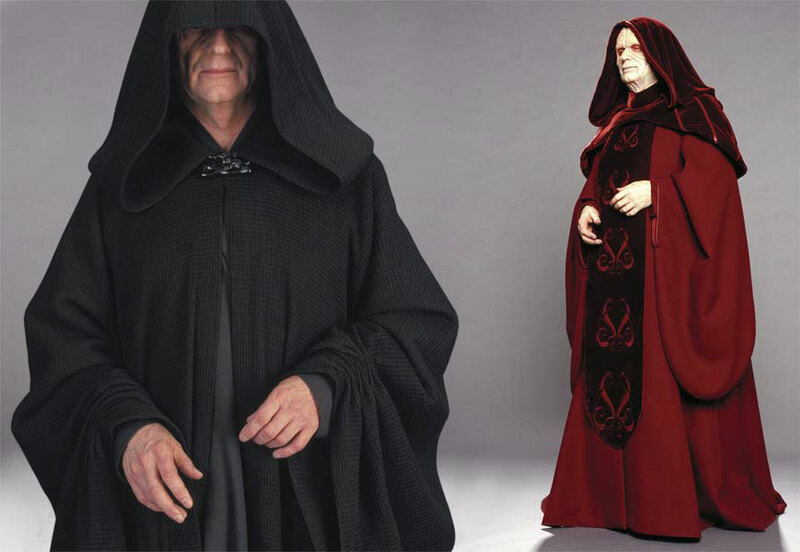 The robe is lined in iridescent blue/purple fabric (cross-dyed shot taffeta preferred). Warm brown or navy tailored pants. Dark brown or black tailored knee-high boots or dress shoes. Hair must be shorn above the collar; naturally occurring hair colors only. Ankle-length coat of a greenish-blue basketweave-like heavy textured fabric with dark green velvet yoke, cap sleeves and large box pleat in back, trimmed in dark green velvet cord. Coat has lightly-padded crinkled dark gray or dark mud brown fabric neck band with a V-point in front and in back with center front of the coat rolled open to reveal the bluish-green underside/lining and the waistcoat beneath, joined by two chevrons of dark green velvet. Leg o� mutton sleeves are also of a greenish-blue basketweave-like heavy textured fabric with dark green velvet cord detail, peeled open to reveal a section of bluish-green underside/lining fabric. Padded dickey of blue ribbed fabric with a wide collar that ends in a V-shape both in front and in back, trimmed in black metallic cord. Waistcoat of bluish-green ribbed fabric ending at a point below the waist with long sleeves and a set of 10 faux floral �buttons� made of green and gold cord with a green stone in the middle. Dark gray or dark mud brown tailored pants. 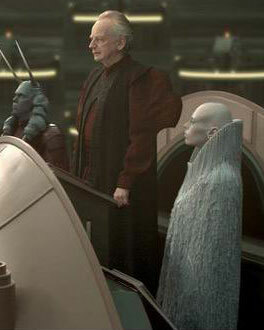 Floor-length senate robe of a blue textured velvet with a pale gold block print. Robe is gathered at the shoulders, has a deep V split in the back with a length of the velvet draping from each shoulder, and is held closed at the front waist by a large round gold brooch with a round green stone in the center. Floor-length cross-placket tunic of a dark gold or dark olive crinkled or Fortuny-pleated taffeta or taffeta-like fabric with long, knuckle-length sleeves and a band collar. Wide pleated obi of a dark gold or dark olive taffeta or taffeta-like fabric. taffeta or taffeta-like cord with very long bell sleeves lined in a dark gold metallic abstract brocade print and a partially open, tall mandarin collar with rounded corners. V-shaped detachable yoke/mantle of very dark brown or black textured velvet or fleece trimmed in dark gold or dark olive taffeta or taffeta-like cord with a long hood down the back lined in pale gold or pale olive taffeta or taffeta-like fabric. Dark brown or black tailored pants. Black knee-high boots or tailored dress shoes. Floor-length, �cross� tabard of a two-tone blue and burgundy floral brocade-like fabric with burgundy cord trim. Floor-length open robe of a purple and blue mottled heavy woven, boucle-like fabric with short cap sleeves and sculpted/contoured leg o�mutton sleeves of a stiff burgundy fabric reaching to just below the wrist, completely covered in �applied passementerie� or similar decoration. Floor-length full A-line coat of a black textured, distressed-like heavy fabric lined in gray with a cross-placket,diagonally-seamed shoulder insets and a tall standing collar. The front panel pulls away from the left side front and is finished for a tabard-like look. Large ovally-sculpted �bishop� sleeves with black leather or leather-like cord trim. Tailored black shirt with a standing collar and fitted sleeves extending over the knuckle. Floor-length cross-placket tunic of a dark bronze taffeta or taffeta-like fabric with long, knuckle-length sleeves and a band collar. Wide pleated obi of a bronze taffeta or taffeta-like fabric. Floor-length robe of very dark black/bronze textured velvet or fleece trimmed in dark gold or dark olive taffeta or taffeta-like cord with very long bell sleeves lined in a dark gold metallic abstract brocade print. and a partially open, tall mandarin collar with rounded corners. V-shaped detachable yoke/mantle of very dark brown or black textured/crinkled velvet trimmed in dark bronze taffeta or taffeta-like cord with a long hood down the back which is lined in dark bronze taffeta or taffeta-like fabric. Black tailored knee-high boots or dress shoes. Floor-length burgundy cross-placket tunic with a band collar and large, very sculpted leg o� mutton sleeves extending to just past the wrist of a heavily crinkled, textured burgundy fabric with burgundy leather or leather-like cord trim. Wide pleated obi of a burgundy crinkled fabric with burgundy cord trim. Floor-length, �cross� tabard of a heavily crinkled, textured burgundy fabric with burgundy leather or leather-like cord trim. Floor-length open robe of a muted red brocade-like fabric in a vertical geometric pattern with wide shoulders. Black or dark brown tailored knee-high boots or shoes. Floor-length undergown of green shot crinkled taffeta or taffeta-like fabric (gown should be lined for structure) with long sleeves ending below the wrist and a standing collar trimmed in dark red cord. Wide, full floor-length very dark green velvet robe with �-length notched velvet sleeves, lined in dark mossy gold-green taffeta or taffeta-like fabric. 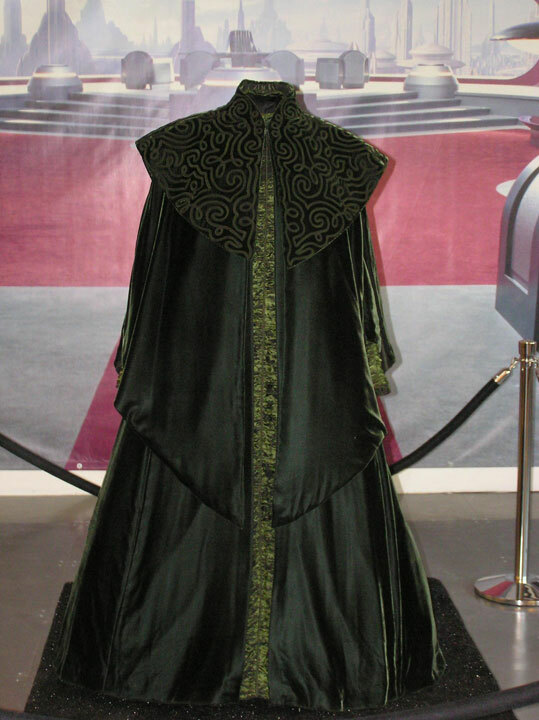 Two very dark green velvet yokes attached to the robe at the neckline with hems ending in points both in front and in back � the larger underyoke has points that end at the knees and side slits that rise to the shoulder tips; the smaller overyoke has wide shoulders, hem tips that end just above the waist with a tall collar covered in a decorative applied cord design. Very dark green or black tailored pants. Dark blue mid-calf-length loose robe of a velveteen-like fabric with wide long sleeves with four light-blue long decorative rectangles filled with a diamond-shaped Celtic knot-like pattern placed at the side fronts and side backs of the robe from just above chest level descending down to almost mid-thigh. Medium blue, sleeveless, almost knee-length tunic of a crinkled fabric. The tunic has a defined yoke with a square neckline and piping trim. Light blue turtleneck long-sleeve sweater or thick shirt with very thick, chunky ribbing. Cool gray wide leather belt with two rectangular flap pouches. Dark navy or black boots, each with an ankle strap and gold buckle. Silver twisted torque collar at the base of the turtleneck. 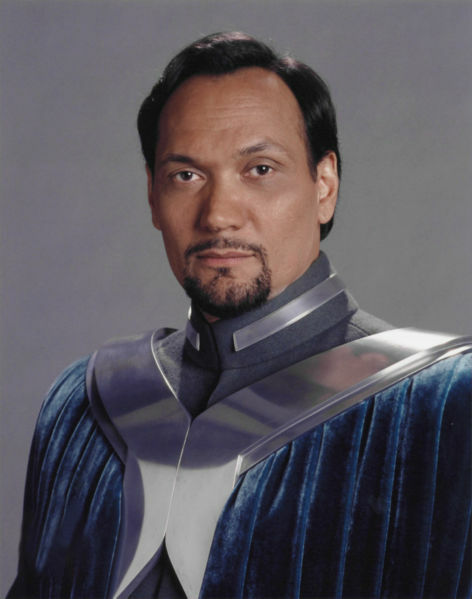 Medium gray-blue mid-calf-length tailored A-line jacket with sleeves that fall below the wrist, a front placket overlapping to the right side front with a horizontal yoke seam, a high standing collar with a small light blue symbol of Alderaan as a �pip� on either side of the center front, and 2� wide epaulettes. Light gray shirt with long sleeves and a high standing collar that just peeks out above the jacket collar. 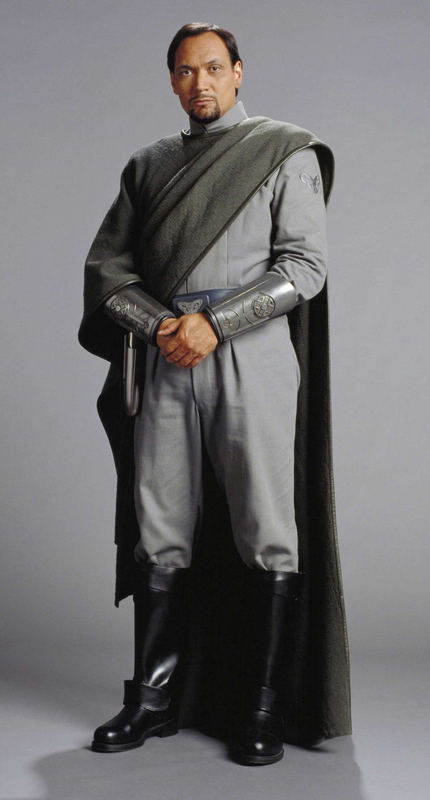 Dark gray-green wide leather or leather-like belt with a silver symbol of Alderaan in the center flanked by two contoured dark gray-green leather or leather-like flap pouches, each with the symbol of Alderaan etched in the flaps. Dark blue floor-length full leather or leather-like coat with large full sleeves and wide cuffs. Coat also has a collar and lapel of light gray short-pile fleece that is just wider than the shoulders, then tapers down the front to just below the hips; the back of the fleece collar tapers down to a point at just below waist level with a gold floral decorated, large fan-shaped cap covering the point and three medium gray-blue 4� long silk-like tassels dangling from the gold cap. Medium gray tailored hip-length jacket with tall, standing collar, long sleeves that fall below the wrist and a front placket overlapping to the right side front with a top edge that slopes lightly downward. The sleeves have wide attached cuffs. contoured 1� wide binding over the seams. The vest falls to a basic A-line shape below the waist and has side slits up to the waist - the front panels of the vest end in a moderate V shape almost mid-shins, while the back of the vest falls to just above the ankles with a straight hem. 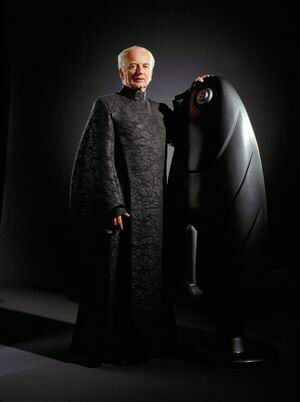 corresponding two-piece rectangular dark gray leather or leather-like buckle are inset in the wider belt with a small gold symbol of Alderaan in the center of the buckle. Knee-high black leather or leather-like boots with a wide half strap over the front 5. of each ankle. Medium gray tailored hip-length jacket with a tall, standing collar and 2� wide epaulettes, long sleeves ending below the wrist with plain contoured cuffs that extend to mid-forearms, each ending in a soft point on the outside of the arm. The jacket has medium gray leather or leather-like piping in the side front, side back and sleeve seams and the collar also has a set of long, plain silver strips with a thin beveled edge attached as �pips� on either side of the collar�s center front (the strips should not extend past the epaulettes). Dark gray wide belt with a rectangular, convex decorative silver buckle with the symbol of Alderaan inset in the center and flanked by convex silver triangles, one pointing to the right and one to the left. 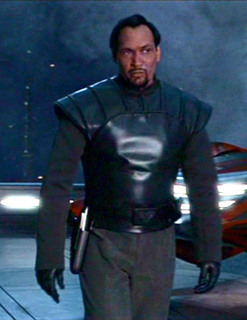 Light gray plain jumpsuit with a zipper placket (or pants and long-sleeve shirt), a tall standing collar and two angled hidden pockets on either side front a few inches down from the shoulder seams (similar to the pockets on the original trilogy Imperial officer jackets), along with a small light gray symbol of Alderaan on the upper left sleeve near the shoulder. 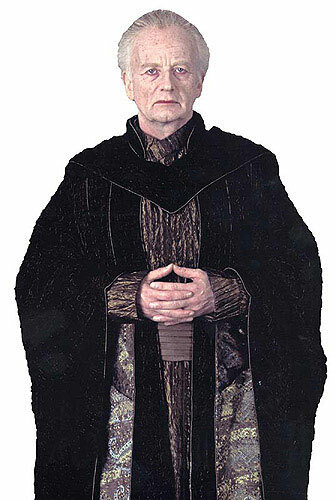 Medium blue-gray wide leather or leather-like belt and a matching leather or leather-like buckle with a silver symbol of Alderaan in the center. A medium blue-gray contoured holster hangs from the belt. Two silver contoured wrist cuffs extending to mid-forearms with a beveled edge at the wrist and an inset deco-like design with yellow and red accents. Medium gray floor-length cape of a thick woven fabric that flips over the left shoulder with a medium gray leather or leather-like �� binding. Medium gray tailored hip-length jacket with a tall, standing collar and 2� wide epaulettes and long sleeves ending below the wrist. The jacket has medium gray leather or leather-like piping in the side front, side back and sleeve seams and the collar also has a set of long, plain silver strips with a thin beveled edge attached as �pips� on either side of the collar�s center front (the strips should not extend past the epaulettes). Dark gray wide belt with a rectangular, convex decorative silver buckle with a small symbol of Alderaan inset in the center and flanked by convex silver triangles, one pointing to the right and one to the left. Two silver wrist cuffs extending to mid-forearms with a beveled edge at the wrist and an inset deco-like design. Wide silver chest harness with a cross-shaped front and trapezoid-shaped back and beveled edges along with a full floor-length teal-blue or teal-green pleated velvet cloak lined in a light gray non-shiny fabric. Medium gray-blue mid-calf-length tailored A-line jacket with sleeves that fall below the wrist. 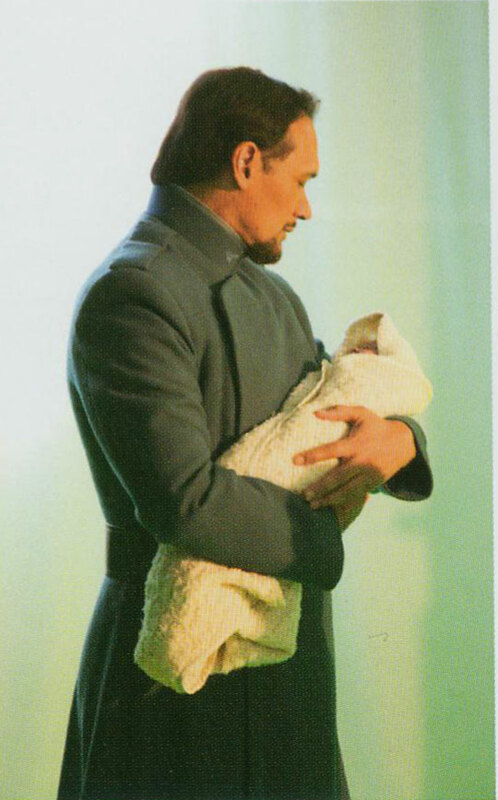 The jacket has a front placket overlapping to the right side front with a horizontal yoke seam, a high standing collar with a small light blue symbol of Alderaan as a �pip� on either side of the center front, and 2� wide epaulettes. symbol of Alderaan in the center and a 2� wide belt carriage in the back. Floor-length full A-line skirt of a medium green-blue soft fabric with silvery metallic threads woven in. The skirt should have some structure, such as a ruffled petticoat beneath. Gown of a light blue metallic brocade-like fabric with a gold metallic medallion pattern, a jewel-neck collar and an asymmetrical hem with the front point ending at about mid-shin and the back point meeting the floor. Below the collar is long oval inset with blue fabric and edged in green-blue cord. Leg o� mutton sleeves ending below the wrist of a medium green-blue soft fabric with silvery metallic threads woven in which have elongated perforations edged in blue satin stitch. The sleeves should have some structure and not be limp. Hair is parted in the center and gathered into a large braid coronet encircling the head, woven with a very thick warm brown raw homespun-like fabric. Naturally-occurring hair colors only; no bangs. descending to just above the knees and one tail reaching just above the gown�s hem with asymmetrical hems similar to the gown. The veil is decorated with leaf and stem patterned in gray. Gold floral buckle-like brooch at the collar and a green-blue abstract rectangular cabochon pin edged in gold with a gold cap and tassel which gathers the inner hem corners of the veil together. Winter white or ivory �-length cape of a crinkled, non-shiny fabric with a high collar and round shoulder cut-outs. Cape has a full back, ending at mid-calf. Winter white or ivory sleeveless fitted top of a crinkled, non-shiny fabric with a scoop-neck reaching to a couple of inches below the bust extending to a long tabard down the front ending at the knees. 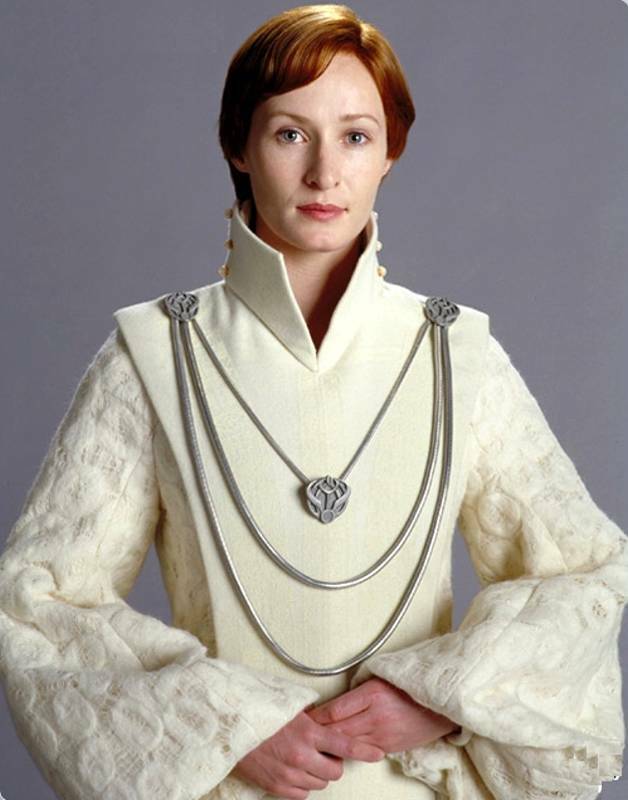 Winter white or ivory sleeveless, fitted, A-line floor-length gown beneath the tabard of crinkled, non-shiny fabric. Winter white or ivory opera-length fingerless gauntlets of crinkled, non-shiny fabric. White or ivory open-toe, mid-heel strappy sandals. Hair pulled back in a ponytail at the crown of the head. No bangs; naturally-occurring hair colors only. White plastic curvaceous cross-shaped headband and a thick winter white or ivory ponytail elastic or wrap. White or winter white floor-length A-line gown of a fleecy fabric or a medium-weight fabric with a circular pattern. The sleeves are bell-shaped and gathered to a tight cuff at the wrist. White or winter white floor-length contoured tabard of a heavy-weight wool-like fabric with a V-neck and a very tall notched collar with a set of three ball-shaped cream buttons on each side. White or winter white tailored flats or pumps. Two silver Hana pendant brooches, one at each shoulder with two thick silver cords draped between them and a silver Hana pendant on a thin silver cord. White, winter white or ivory undergown of a textured, slightly metallic medium-weight fabric. White, winter white or ivory-colored �-length overgown of a crinkled or Fortuny-pleated fabric with very large, knuckle-length bell sleeves, lined in a silk or silk-like fabric of the same color as the overgown. White, winter white or ivory-colored floor-length brocade tabard of a swirl or watered design with a V-neck, cap sleeves shaped to the shoulders, and tall notched collar. The tabard also has a lace or lace-like round medallion appliqu�d to the breast and each shoulder. White, winter white or ivory tailored flats or pumps. Large silver art-deco-like Chandrilan cage hair cap which covers the ears. A-line undergown of an ivory or off-white heavy silken brocade-like embroidered fabric (typical silken brocades, damasks and jacquards accepted); the skirt should have some structure. Narrow V-shaped tabard extending from the bust to just above the hem, constructed of black heavy lace encrusted with black jet beads and sequins; at the top of the tabard is a chevron laid with black jet and cream iridescent beads with an alternating short and long fringe of black jet and cream iridescent beads. 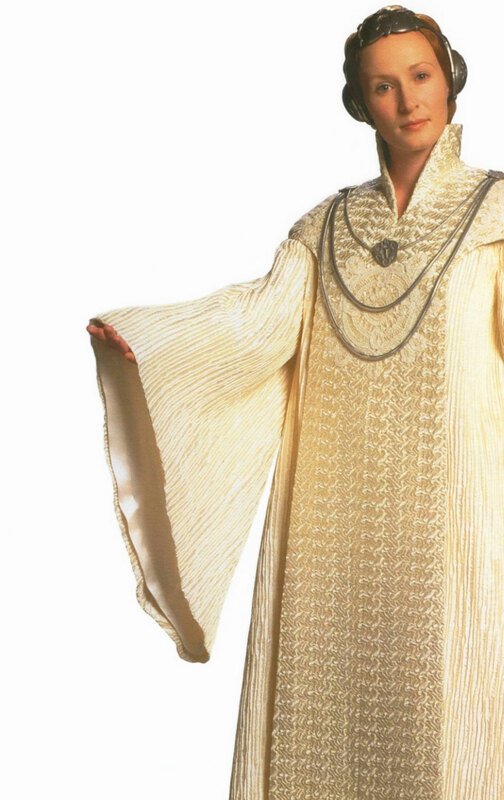 Floor-length robe of a silken black crinkled fabric with long fitted inner sleeves and large knee-length, round wing-shaped oversleeves trimmed in the same ivory or off-white heavy silken brocade-like embroidered fabric as the undergown; the robe does not close over the tabard. Large contoured yoke of black velvet trimmed in the same ivory or off-white heavy silken brocade-like embroidered fabric as the undergown; the yoke should have structure and not be limp. Large oval brooch of an ivory iridescent shell or mother-of-pearl rimmed in an iron gray art nouveau frame. Large fan headdress made up of 10 sections of an ivory iridescent shell or mother-of-pearl rimmed in an iron gray art nouveau frame, with a length of black jet beads on either side of the frame descending from the temples. Hair is gathered into two large fans of hair, one above the other, rising a couple of inches above the headdress, with a large supportive bun beneath at the nape of the neck. No bangs; naturally-occurring hair colors only. White make-up on the face, neck and hands (must not be splotchy or uneven). A red upper lip and a white lower lip with a red strip down the center, with a red dot on each cheek centered beneath each eye. Eyes should be rimmed in heavy black eyeliner. Kimono-style undertunic or gown with long, knuckle-length, fitted sleeves in a dusty rose-pink pleated, homespun fabric. Floor-length skirt or Hakama pant of finely knife-pleated iridescent lavender/pink cross-dyed silk dupioni or dupioni-like fabric. Floor-length full kimono of a warm, golden silver metallic brocade in a herringbone-like pattern, large knee-length, rounded wing-shaped sleeves and a small train. The outer seam of the sleeves is trimmed with lavender purple piping in the same fabric as the obi. The lower front edges of the kimono are folded back asymmetrically and tacked down to expose the underskirt. The kimono is trimmed with a wide band of lavender purple velvet or velveteen embroidered with silver and gold decorative elements. Very wide, pleated obi of a lavender purple silken brocade or jacquard with a scattered fan pattern; the obi has a large obi pad in the back. Art Deco-like perforated silver fan headdress with flanking filigreed half egg shapes dry brushed in a cool lavender that cover the ears. Rising from the silver fan is a larger fan of tall, soft and thick ostrich feathers in a cool lavender gray shade. Thick gray lace appliqu�s encrusted with silver/hematite beads and gray pearls are attached to the front and back of the fan, with many multi-length strands of beads and pearls descending from them. The center front section and side back sections of strands are pulled back, twisted and pinned around the half eggs. The side front sections and center back sections are left to hang. Hair is pulled back into several long thin braids tied off with silver and hematite beads. White make-up on the face, neck and hands (must not be splotchy or uneven). Lavender upper lip and white lower lip with a lavender strip down the center. Beginning 1� above each brow, aligned with the center of each eye, is a long thin lavender line that descends down over the lid and along each cheek, to end just above a lavender dot; the dot is in line with the nostrils. 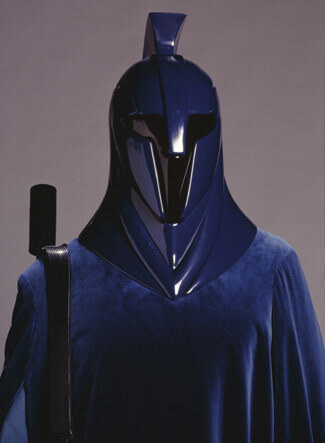 Screen accurate blue helmet with two Roman-like black plumes placed at a V-shaped angle and open face (no visor). Helmet color should match outer robe color. Royal or dusty blue ankle length velvet or velvet-like �sleeved� outer robe (no crushed or panne velvet) with a slit for each arm and a blue lining a shade lighter than the outer robe. Blue shirt or tunic and pants or long sleeved coveralls in a shade lighter than the outer robe. Blue fitted gloves that match outer robe (black is acceptable but not preferred). Gloves should be worn under the sleeves of shirt/coverall. Black at least calf high leather or pleather boots, no rubber boots. Pants may be tucked or untucked into boots. Senate Rifle or Force Pike. Grayish blue inner robe. Blue should be lighter than outer robe. Screen accurate blue helmet with solid plume and black visor. Helmet color should match outer robe color. 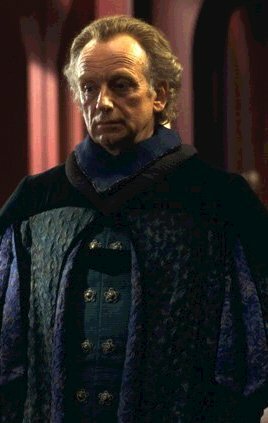 Royal or dusty blue ankle length velvet or velvet-like �sleeved� outer robe (no crushed or panne velvet) with a slit for each arm, and a blue lining a shade lighter than outer robe. Blue shirt or tunic and pants or long sleeved coverall in a shade lighter than the outer robe. Blue fitted gloves that match outer robe (black is acceptable but not preferred). Gloves should be worn under the sleeves of the shirt/coverall.